This entry was posted in Opinion and tagged algorithms, bass, ccss, ccssm, common core, Skemp. Bookmark the permalink. The mention of “the” standard algorithm in the CCSSM has bothered me since I first read it. Since most of the CCSSM content standards focus on conceptual understanding, I was surprised when those words were used. I figured that it was a cave in to pressure from traditionalists (whatever that means). I much prefer your wording and will follow your lead and using your version of 4.NBT.B.4, 5.NBT.B.5, and 6.NS.B.2. If “they” tell you to cease and desist, will you let me know?? @Christopher, what is your objection to saying that the lattice method is a manifestation of the standard algorithm? I studied all the items in that figure carefully, and they appear to me to be mathematically equivalent. i.e. each involves computing four products (9×6, 9×3, 4×6, 4×3) and adding the results — with attention to place value. Random thought: I’ve seen Algebra teachers at my school use a version of the lattice method for teaching students how to multiply binomials — picture (x+4)(x+6) rather than (90+4)(30+6). What is especially neat about that way of writing the work down is that the like terms are pre-organized for you — just add along the diagonals. This is transparent when working with polynomials, but opaque when working with numbers. For that reason I would teach “the lattice” to students last. If I were a K-5 math teacher, I would favor this order: 1) using unit cubes/blocks of ten/1000 cubes, then 2) using the very explicit area/array at the top left of the figure, and upon mastering that proceeding to 3) the method shown in Figure F, essentially an abbreviation of the previous method, then 4) doing partial products as shown in figure D, then (maybe) 5) showing the lattice method and discussing connections to #4. Method E, which is closest to “the standard algorithm” as I was taught, is my least favorite. I hate the carries. And I feel that it is the least natural of the methods presented. No one thinks in terms of “94 times 6” — but we all know 9×6 and 4×6. Yes, students should develop an understanding that 94×36 means “94 sixes and 94 thirties,” but that understanding does not have to dictate the “main alrgorithm” we teach students. I agree about rewriting “standard algorithm” in the Common Core standards. I think using place value to decompose makes so much more sense. I have been working for my district to write 6th grade math curriculum and I just could not force teachers to teach what I call the “old school” algorithm for division. Partial quotient just makes more sense and helps students keep the value of the numbers in mind rather than simply doing a “digit dance” they really don’t understand. @Stephanie: tell me more about “partial quotient” vs. the “old school algorithm.” I don’t know what you have in mind for either of these. Opinion: I don’t like Wu’s take on standard algorithms. Take 23 * 4. Since he defines the standard algorithm as requiring use of only one-digit multiplication, wouldn’t he exclude an algorithm that sees this as 20*4 + 3*4 from the camp? James, two things. First on the lattice…if an algorithm is defined by its steps, the lattice seems to me to require different steps than the partial products algorithm. In partial products (as Michael points out), we multiply 20•4 in the process of calculating 23•4. In the lattice, we multiply 2•4. That’s a different step. In what Wu and I agree to be the standard algorithm, we combine multi-digit results of single-digit multiplications in the midst of our multiplying. In the partial products and lattice algorithms, the results of the single-digit multiplications are not combined until all of the multiplication is complete. The steps to describe these methods are different, so they are different algorithms by definition. If what we really mean to point to, though, is their similarity, then let’s name that similarity. All of these (unlike the Russian Peasant Algorithm) are algorithms based on place-value decomposition. Second thing…you can learn more about the partial-quotients algorithm that Stephanie refers to here. Michael, I actually agree with Wu on this point. Here’s a thought experiment (which could turn into a real one): Have adults solve the problem 94×36 (the one in the Fuson and Beckmann diagram) with paper and pencil. I venture a guess that 90% make the marks on paper that match Method H on p. 25 of the article. 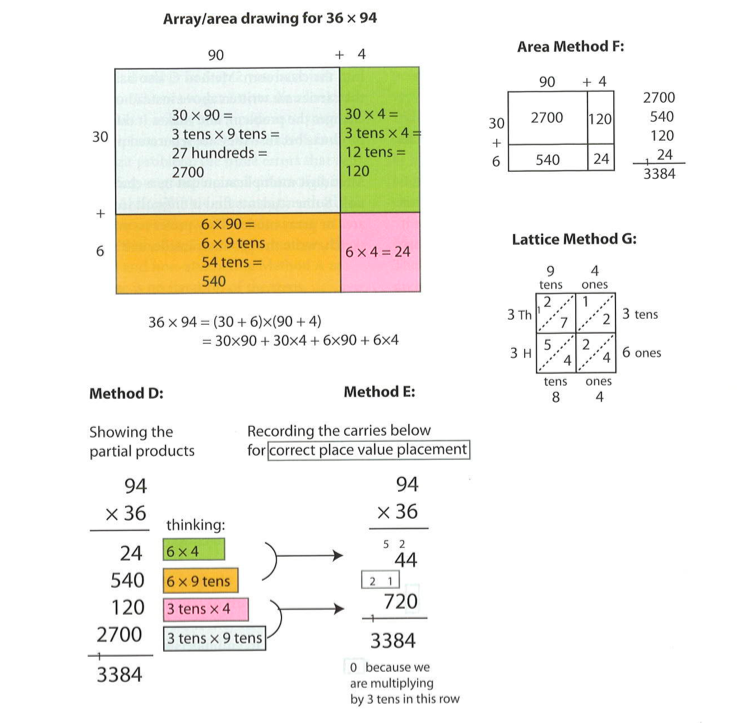 Then demonstrate partial products (Method D) and see whether they agree that this is the same algorithm with the same steps as the ones they just performed. Then do the same with the lattice. @Michael: I think he might argue that 20*4 is really just 2*4. i.e. 20 is “2 groups of 10,” so the answer is 2×4 tens. Chris, I plan to reveal the complete history of this just as soon as I’ve been dead for 10 years. In the mean time, I did want to point out that there is an intentional evolution of language 1.NBT.4 -> 2.NBT.7 -> 3.NBT.2 -> 4.NBT.4, going from “strategies based on place value, properties of operations, and/or the relationship between addition and subtraction” (1.NBT.4, 2.NBT.7) to “strategies and algorithms based on place value and the properties of operations, and/or the relationship between addition and subtraction” (3.NBT.2) to “the standard algorithm” (4.NBT.4). The phrase “algorithms based on place value and the properties of operations” was intended to capture what you are trying to capture with the phrase “algorithm based on place value decomposition” (I think). Note the distinction between strategies and algorithms here; strategies work in special situations, algorithms are general. I agree with you that the lattice algorithm and the partial products algorithm are both algorithms based on place value and the properties of operations, but not the standard algorithm. There is a similar evolution for multiplication and division, 3.NBT.3 -> 4.NBT.5 -> 5.NBT.5. Thanks for stopping by, Prof. McCallum. I agree wholeheartedly with the equivalence of the two phrasings you point to. This serves to make the original point, right? Namely that the standard algorithm compromise isn’t really a compromise at all. It’s a phrase that is quite clearly being taken to mean different things by different parties (yours as an example of one meaning, and Beckmann and Fuson’s as an example of a conflicting one, and all three of you are on the Progressions writing team!). This would seem to serve to obfuscate rather than to clarify. Unavoidable, I am sure. But regrettable nonetheless. Reblogged this on Khuram Ali. Like Elaine Watson, what I object to is the use of “the” in “the standard algorithm”. It implies that there is one and only one correct way to do the computation, a message that was delivered to us with force in elementary school. As a youngster, the particular variant that we were expected to learn was called “long multiplication”, and it caused me enormous problems. A lot of my difficulties disappeared when I discovered Method E that you illustrated from Fuson and Beckmann. We were not taught that alternative method, and at that time I actually viewed it as cheating (and I suspect that my teachers did as well). I wrote about in http://www.mathinautumn.blogspot.ca/2014/12/a-cheat-for-standard-multiplication.html . I very much like your alternative suggestion of “an algorithm based on place-value decomposition”.